Publisher: Clarendon Press, Oxford, 1894. 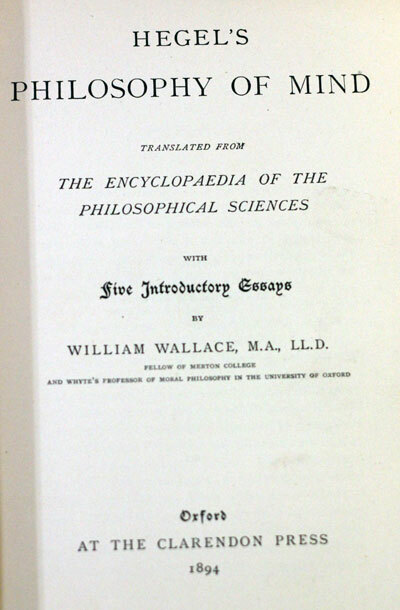 First edition, scarce. Condition: Hardcover, cloth. Shaken binding, top and bottom of spine rubbed, otherwise overall good. 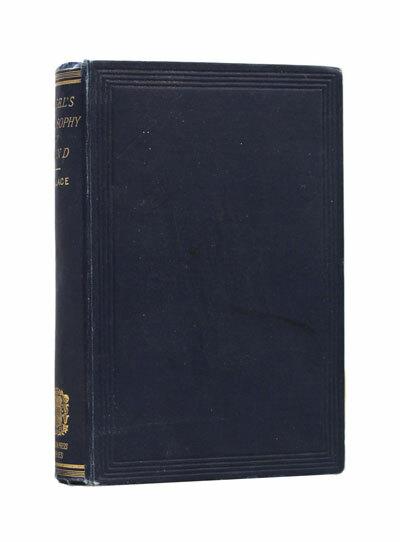 This is the first English edition of Hegel’s Philosophy of Mind – a landmark one. Scarce! The Philosophy of Mind is the final part of Hegel’s Encyclopedia of the Philosophical Sciences in Outline. In the last century or so of Hegel scholarship, the Encyclopedia has played a relatively minor role, despite the fact that it lays out the mature form of Hegel’s system as that system was taught by Hegel himself (he wrote the Encyclopedia as the basis for his lectures). It has been largely overshadowed by other texts: the Phenomenology of Spirit and the Science of Logic dominated 20th-century discussion of Hegel, while the Philosophy of Right has recently attracted a good deal of attention. The roots of this canonical situation can be found in the content of the Encyclopedia itself. It is divided into three parts: the Logic, the Philosophy of Nature, and the Philosophy of Mind. The first is essentially a short version of the material presented in great detail in the Science of Logic; the Encyclopedia Logic has thus played second fiddle to the Science of Logic. The Philosophy of Nature is normally taken to present a misguided attempt to deduce the laws and structure of nature from a priori principles; this part of Hegel’s system has been widely (and wrongly) scorned since his death. The Philosophy of Mind itself is divided into three main parts: “Subjective Spirit,” “Objective Spirit,” and “Absolute Spirit.” Much of the content of the latter two (ranging over political philosophy, ethics, aesthetics, philosophy of religion, and metaphilosophy) is developed in detail in the Philosophy of Right and in the posthumously published Lectures on Aesthetics, Lectures on the Philosophy of History, and Lectures on the Philosophy of Religion. Hence “Objective Spirit” and “Absolute Spirit” bear to those texts an analogous relationship to that which the Encyclopedia Logic bears to the Science of Logic — the former give the skeletal presentation fleshed out by the latter. It can thus appear that much of the content of the Encyclopedia is superseded by other Hegelian texts. For those convinced that the Encyclopedia Logic, Philosophy of Nature, “Objective Spirit,” and “Absolute Spirit” are so superseded (this reviewer is emphatically not one of them), there remains only “Subjective Spirit” as a possible object of interest in the Encyclopedia; but this portion of the Philosophy of Mind presents its own systematic difficulties. Here, in subsections on “Anthropology,” “Phenomenology,” and “Psychology,” Hegel attempts to lay out the structure of subjectivity — that is, those aspects of our objective experience and knowledge of the world that can be attributed to the “subject” having that experience and knowledge. Yet in doing so he appears to embrace just those Kantian distinctions and terms — intuition, representation, imagination, etc. — he is thought to have overthrown as a result of his critical engagement with Kant; the revolutionary young philosopher of the Phenomenology of Spirit, the philosopher of the Unhappy Consciousness and the Master/Slave Dialectic, appears to have reverted to a dry mix of Kantian terminology and Wolffian rationalism tinged with pantheistic mysticism as soon as he was offered an endowed chair. – from a review of a later revised edition by Sebastian Rand, Georgia State University, at the Notre Dame Philosophical Reviews Journal.